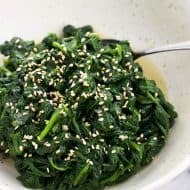 Over the past five-ish years that I’ve lived with my husband, I’ve realized that I seem to have absorbed his food dislikes. Thankfully there’s not many (or rather, not many we’re not in agreement on), but possibly our biggest point of contention is regarding mushrooms. I like mushrooms, he hates them. That’s fine. But as chief grocery shopper, I recently became aware of the fact that I rarely ever, and maybe even never, buy mushrooms. Why? I don’t really know. I pass them by at least once a week when I grab a stalk of celery, which is in the same display case. 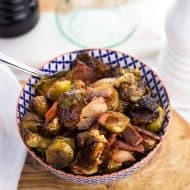 It probably has to do with cooking laziness and not wanting to make two dishes or separate out mushrooms from a portion of whatever it is we’re eating. It was time for a change. I’ve since been stuffing various ingredients into portobello mushroom caps (hello my old friend!) and can’t get enough. 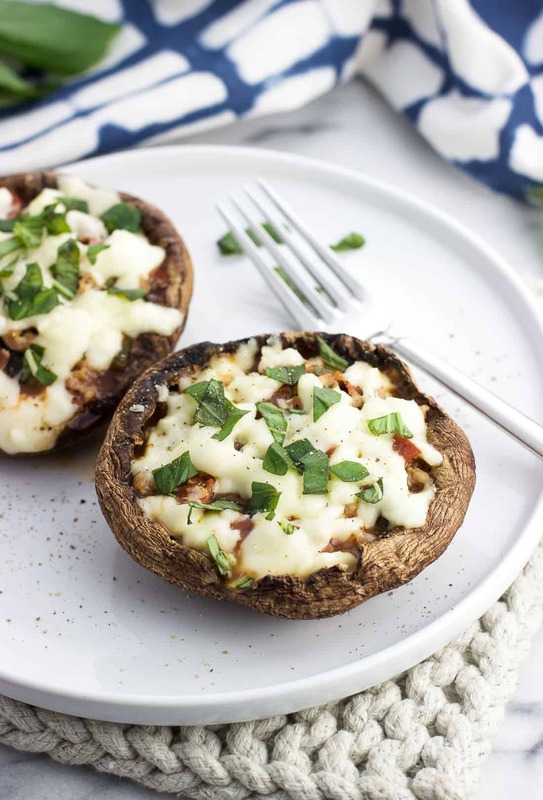 These supreme stuffed portobello mushroom pizzas are filled to the brim with classic supreme pizza flavors, all in a healthier vessel. 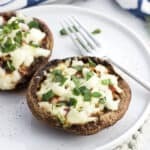 Portobello mushroom pizzas are pretty simple in terms of ingredients and method, but there are a few things to keep in mind to get the best portobello mushroom pizza eating experience possible. 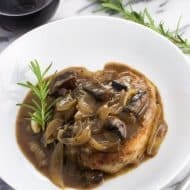 You’ll notice a lot of these tips circle back to the main point of criticism with portobello mushrooms: they can get soggy. Not good! Because we want to prevent the mushrooms from soaking up too much liquid, you don’t want to dunk them under water to clean them off. You’ll still need to tidy them up because they’ll likely be dirty, but do so by dampening a paper towel and gently wipe each mushroom cap down until the dirt is removed. As an aside, I was reading one of the home magazines and they mentioned using a mushroom brush, which is just as it sounds: a brush specifically designed for the purpose of cleaning mushrooms. By all means go ahead and use one of those if you have one, but I’ll stick to the paper towel method. Once they’re washed and the stem and gills are removed, you’ll want to pre-bake the portobello caps before adding the fillings. This allows some of the moisture to cook out before assembling the portobello mushroom pizzas. When I want something to ward off moisture in the oven, like with oven fried tofu or parmesan almond crusted pork chops, I’ll use an oven-safe wire rack over a baking sheet. This prevents the bottom side of the food from staying soggy because it lets the air circulate all around it while it bakes. After quickly seasoning the mushrooms, I placed them gill-side down on a WELL sprayed wire rack and baked them for about ten minutes. 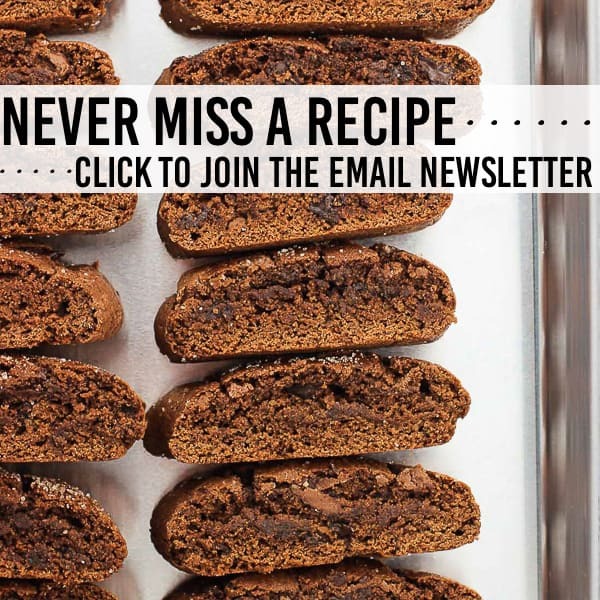 You’ll be surprised to see how much moisture ends up on the baking sheet afterwards, so do use a rimmed baking sheet. Now it’s time for toppings. A supreme pizza has a lot going on, with a big assortment of vegetables and meats. Olives, onions, mushrooms, and peppers are usually in the mix, along with sausage and pepperoni. Since the whole shebang is going in a mushroom, I left mushrooms out from being a topping. 😉 Stayed true to everything else, though! Of course, mix and match toppings as you like. 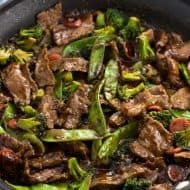 This would be a great recipe for using up leftover bits of cooked meat, extra veggies, etc. Once assembled, add mozzarella over top and bake for another ten minutes or so, or until the cheese is melted and everything is heated throughout. You can also pop them underneath the broiler for a quick minute to get the cheese even more gooey (highly recommend). 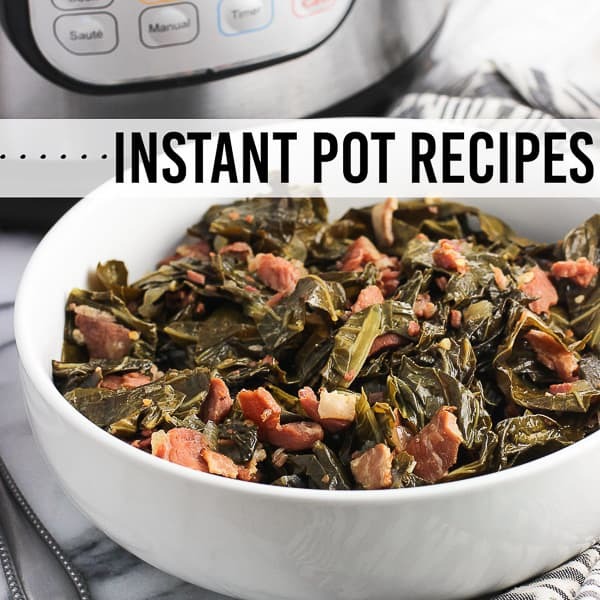 This is a great recipe for using up leftover ingredients. 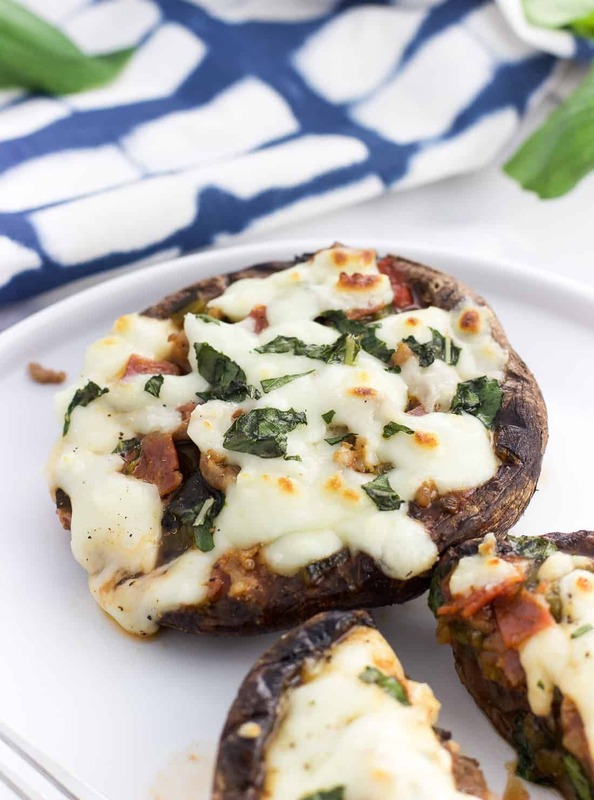 When I made these portobello mushroom pizzas for these pictures, I used some caramelized onions that I can’t stop myself from putting on everything. Fresh chopped onion is what I wrote in the recipe card below, and also perfect here. The ingredient quantities are a guideline. Use your preferred amounts! 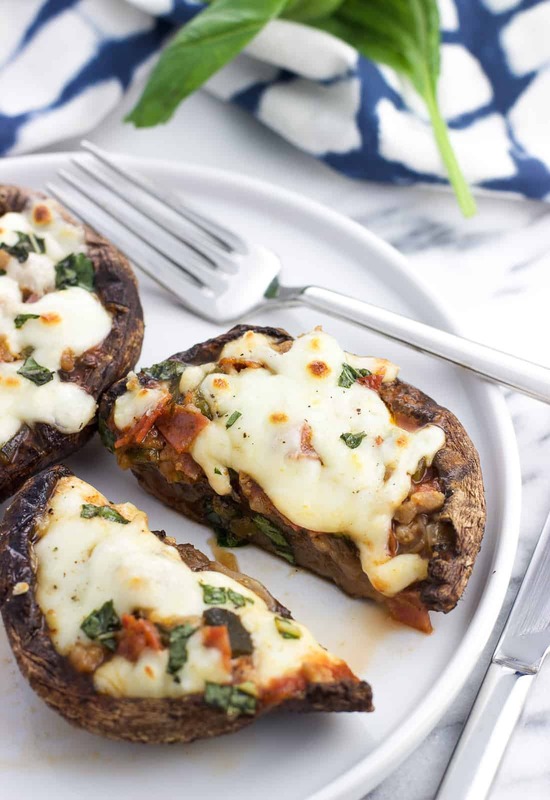 Supreme stuffed portobello mushroom pizzas are a delicious way to enjoy all the flavors of a supreme pizza in a healthier way. 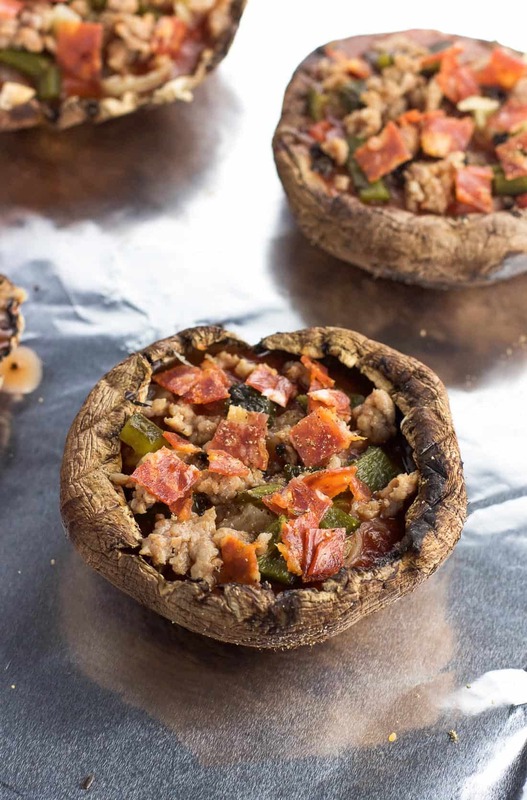 A mixture of pizza sauce, Italian sausage, pepperoni, peppers, olives, and more are covered in fresh mozzarella in these easy stuffed portobello mushrooms. Preheat oven to 400°F. 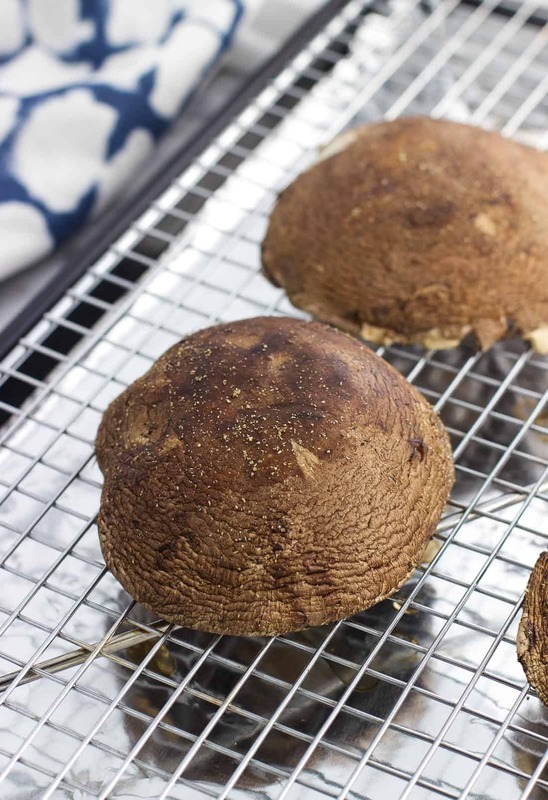 Wipe eat portobello mushroom cap with a damp paper towel to clean them off. Remove the stems and gently scrape out the gills. Place an oven-safe wire rack on a rimmed baking sheet. Spray it generously with cooking spray. Season the front and back of each mushroom cap with salt, pepper, and garlic powder. 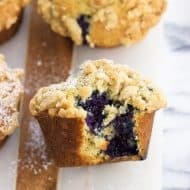 Place them on the wire rack and bake for 10 minutes. Blot any excess moisture that you can from the mushrooms and flip them over. 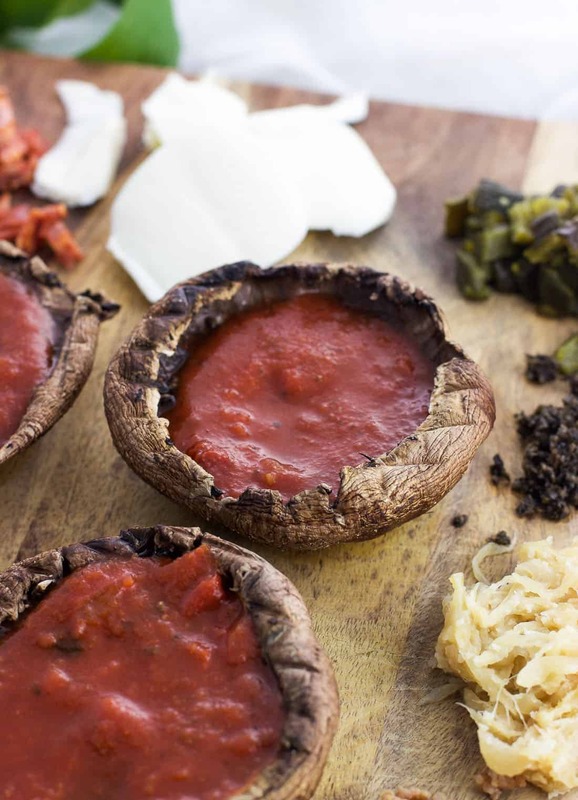 Spoon approximately 1 1/2 tablespoons of marinara sauce into the well of each mushroom cap. Evenly scatter sausage, pepperoni, onion, olives, and peppers over each mushroom, and top with sliced mozzarella. Bake for 10 minutes, or until heated throughout and the cheese is melted. 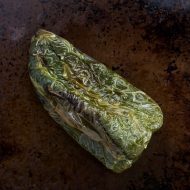 If desired, pop them under the broiler at the end of the cook time to brown the cheese. Garnish with fresh basil and serve immediately. 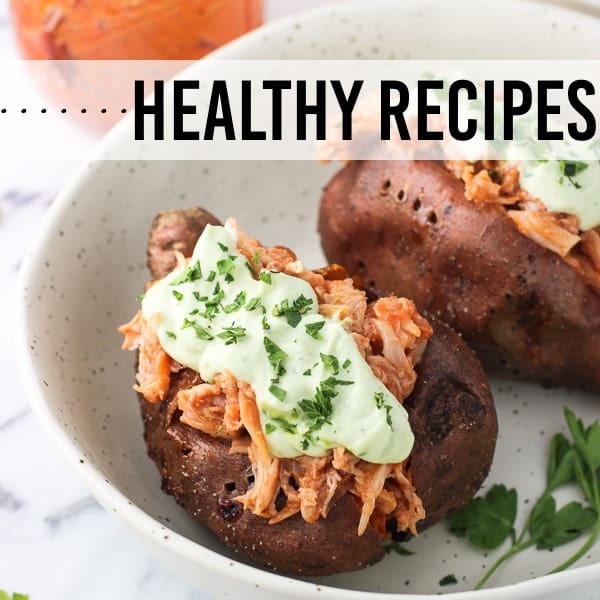 Such an interesting recipe to try with mushroom. 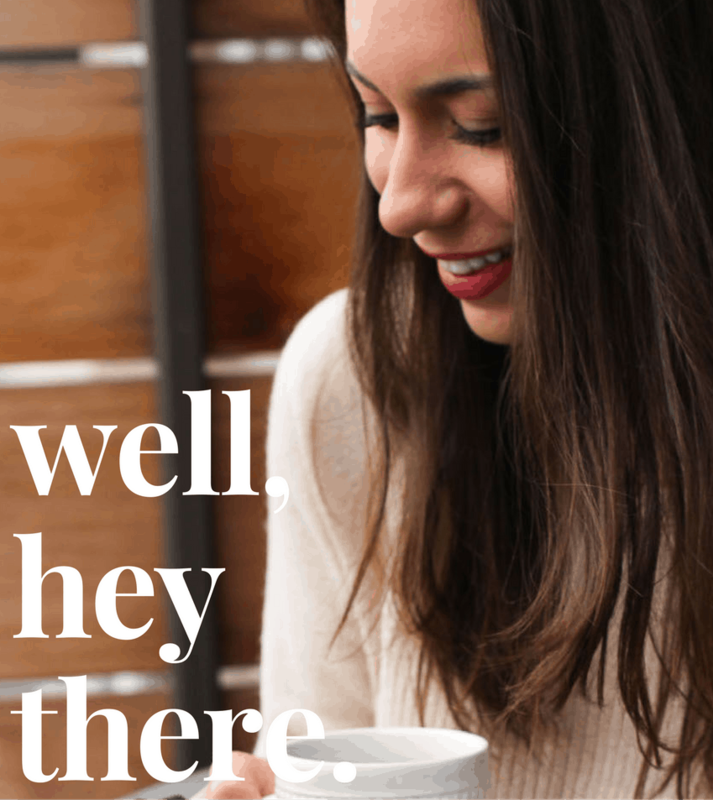 Pinned for later. Thanks!